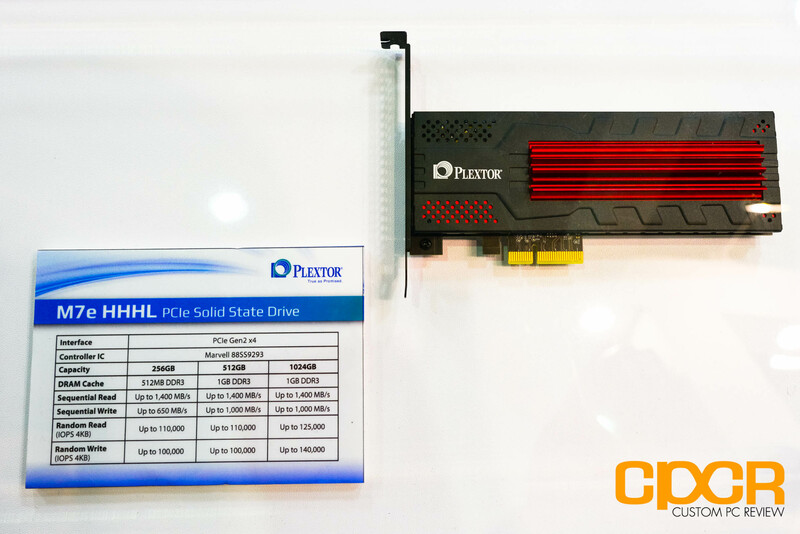 As usual, Plextor had a big showing at Computex with a number of upcoming SSDs and new and improved software stack to show off as well. Quite possibly the biggest showing for Plextor at Computex is the soon to come Plextor M7e PCIe SSD which will succeed the Plextor M6e launched last year. Plextor did show off the M7e at CES earlier this year, but they’ve now a live demo of the SSD in operation along with a new PCIe x4 to M.2 adapter PCB design that lights up the back of the unit to give off that extra “cool” factor. The Plextor M7e will still be using Marvell’s 88SS9293 PCIe Gen 2 x4 controller, which is the same controller that’s used in the Kingston HyperX Predator since earlier this year. 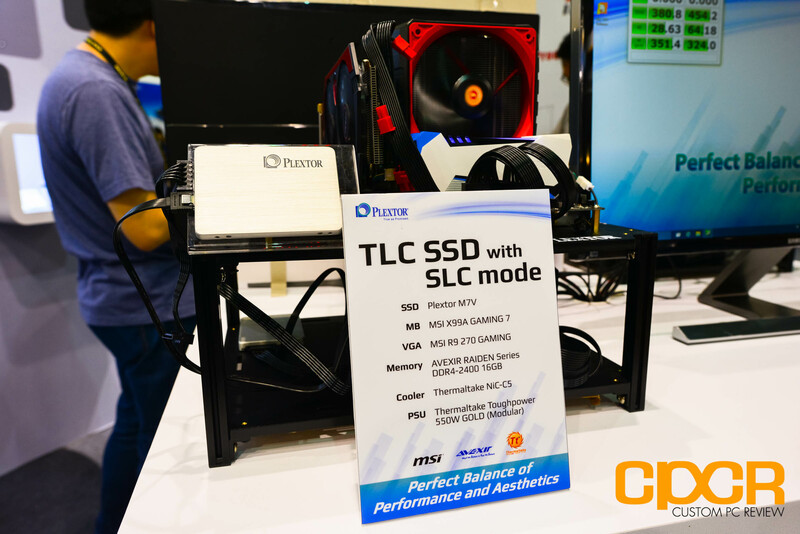 Of course, there’s no doubt Plextor will have their own special firmware as they’re one of the few SSD vendors on the market with their own firmware team. 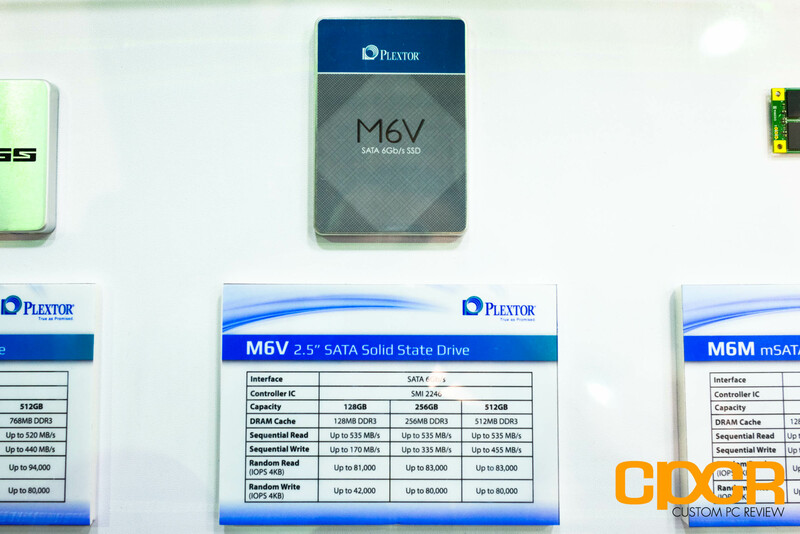 Plextor is only expected to unveil the drive in capacities of 256GB, 512GB, and 1TB. Performance on the drive is rated at 1,400 MB/s sequential reads across the board for all capacities, and up to 1,000MB/s sequential writes for the 512GB/1TB models. Maximum random read/write performance can reach up to 125,000/140,000 IOPS, but only for the 1TB model. 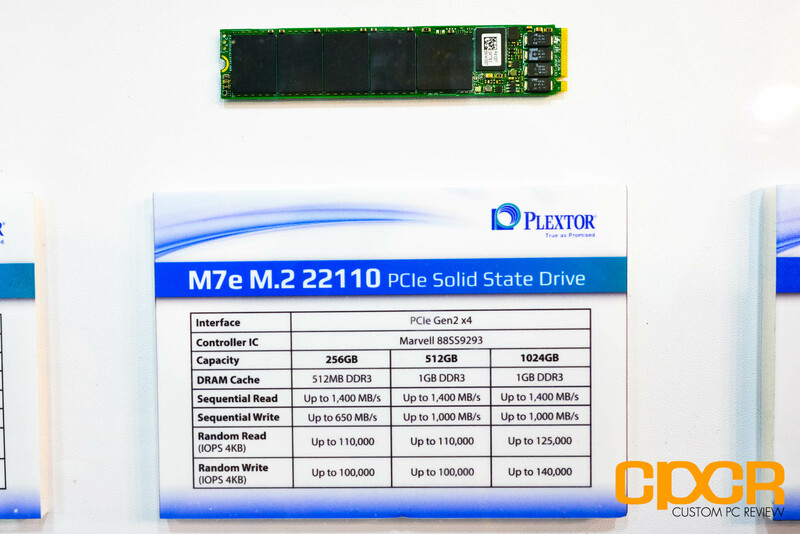 The Plextor M7e is expected to launch sometime in Q3. 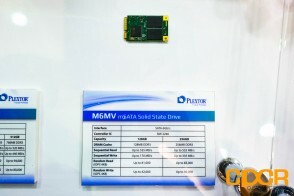 Plextor also showed off a M7e M.2 22110 variant which includes full power loss protection. I’m told that this will be a special order SSD for companies seeking full power loss protection. 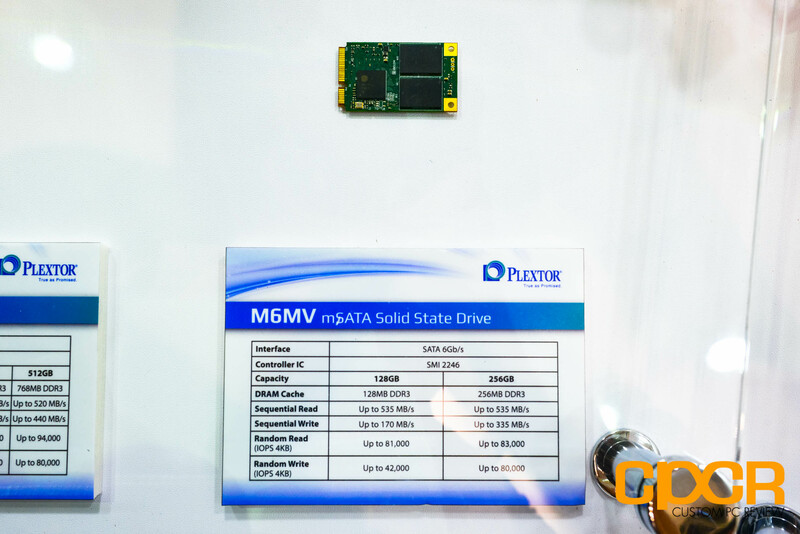 As the Plextor M7e is designed for the enthusiast segment, Plextor is also expected to launch a new 15nm TLC based SSD, the Plextor M7V (V for value). We weren’t given much information about this drive, but I’m guessing it’ll likely be using Silicon Motion’s SM2256 controller. Plextor did have a Cystal Disk Mark demo up and the drive was able to reach the expected ~500MB/s range. 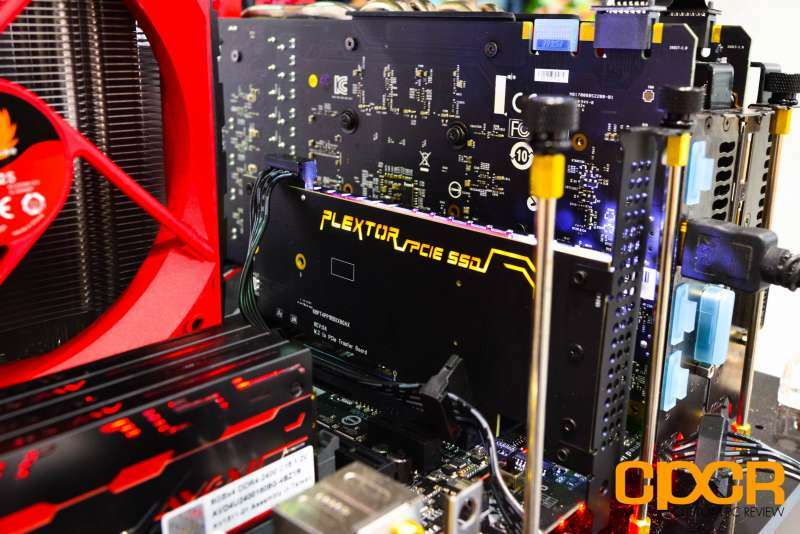 Plextor is still working on getting the drive ready and doesn’t expect this one to ship until 2016. Plextor also showed off the upcoming M6V lineup of SSDs which will make up the value lineup for this year’s Plextor SSDs. 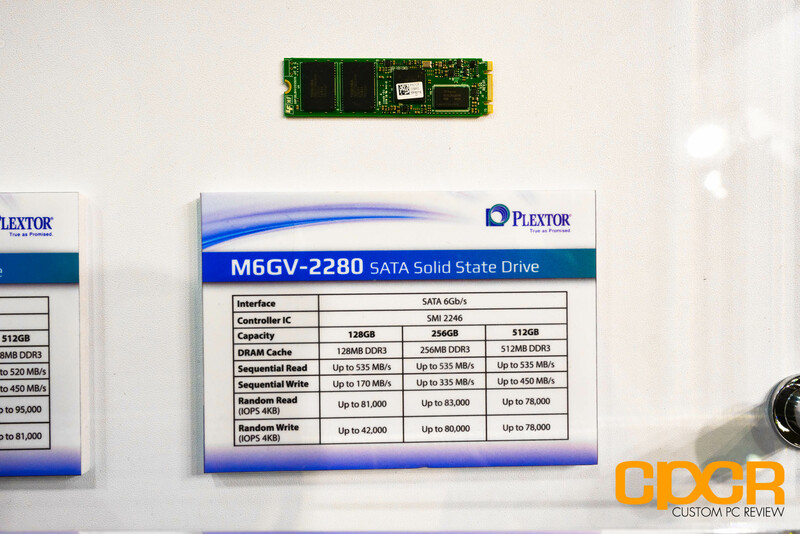 These drives will use Silicon Motion’s SM2246 controller with Plextor’s secret sauce firmware and Toshiba 15nm Toggle Mode MLC. Performance on the drive is expected to reach up to 535/455 MB/s sequential reads/writes and 83,000/80,000 IOPS random reads/writes. Plextor will have the drive in the 2.5″ SATA, mSATA, and M.2 2280 SATA form factors. Plextor’s software stack is also getting huge improvements with the biggest coming to PlexTurbo. 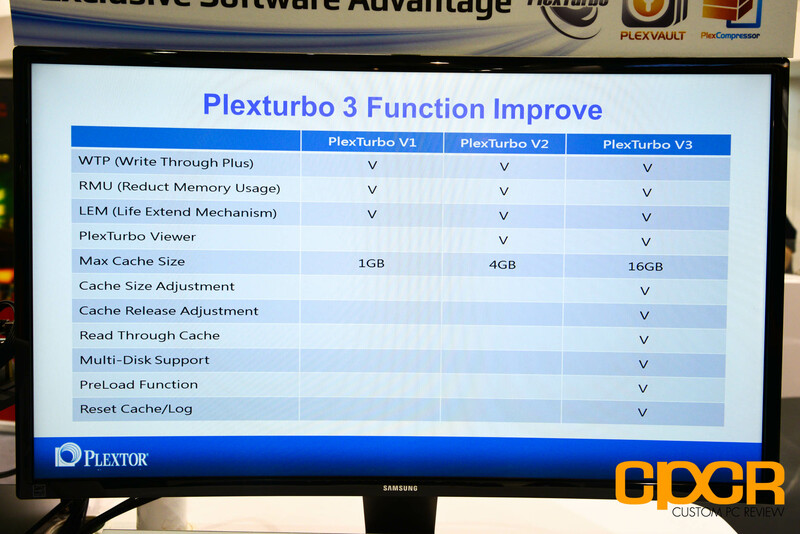 PlexTurbo is now entering its third revision which will now see a host of new features including the expansion of the cache to use up to 16GB of memory. It now also supports multiple SSDs, preloading the cache after restarting the system, and much more. The unfortunate thing about this is that the version of PlexTurbo you get will depend on the drive purchased. Only Plextor flagships such as the M7e will receive PlexTurbo V3 while older or value drives may receive PlexTurbo V2 or V1. Those interesting in learning the differences between PlexTurbo and competing solutions can check out our review of the Plextor M6e Black Edition which discusses PlexTurbo V2 in detail. A new software being introduced this time around is PlexVault which is designed to help those who need to store “sensitive” data. 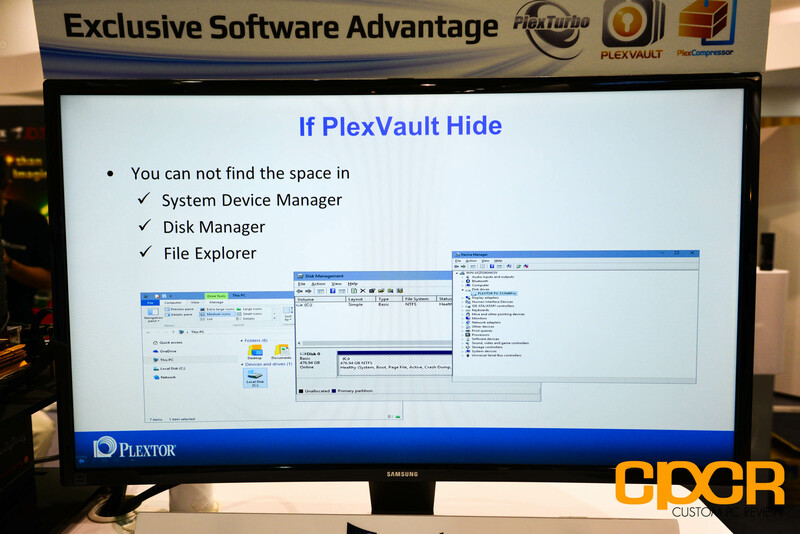 PlexVault works by creating a completely “invisible” partition on your SSD that can only be accessed through a custom hotkey combination. According to Plextor, the partition can’t be seen by file explorer, disk manager, etc. Apparently it can’t even be accessed even if the drive is moved to another computer, but the files are supposedly not encrypted. Not completely sure how that works, but we’ll see once we get our hands on a copy of this. In addition to PlexVault, Plextor is also launching PlexCompressor which is an interesting piece of software that claims to be able to help create additional drive capacity over time by compressing files that aren’t used in over 30 days. The compression is completely software based and exists on top of the file system, so it will eat up CPU cycles in the background doing this, but Plextor assures us that this will in no way affect the user experience. When files older than 30 days are accessed, they will be decompressed which may result in opening the file slightly slower than if it hadn’t been compressed. One question I did have is what happens when the drive is filled up, PlexCompressed, then filled up again, then all of a sudden you decide to access all of the compressed files at once. 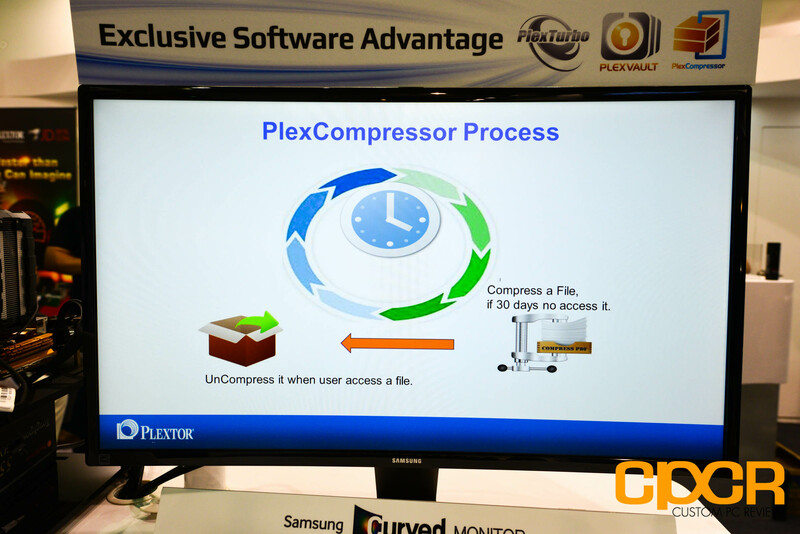 Plextor explained that there is a reserve amount of storage PlexCompressor will maintain so that at a certain point, PlexCompressor will stop compressing files to prevent issues with a ton of sudden file decompression.